Karanji / Gujiya is a traditional sweet made during festivals. Spicy mutter karanji is a crispy and spicy snack stuffed with fresh peas and a variant of the conventional sweet Karanji. Ginger grated - 1 tsp. In a wide mixing bowl, add the ingredients for dough except water and ghee. Melt ghee and pour warm ghee in the flour and mix well. It will become like bread crumb texture. Now add water little by little and knead the dough. Dough should be stiff. I used 1/3 cup of water. Once the dough is semi-soft, cover it with a damp muslin cloth and set it aside for at least half an hour. 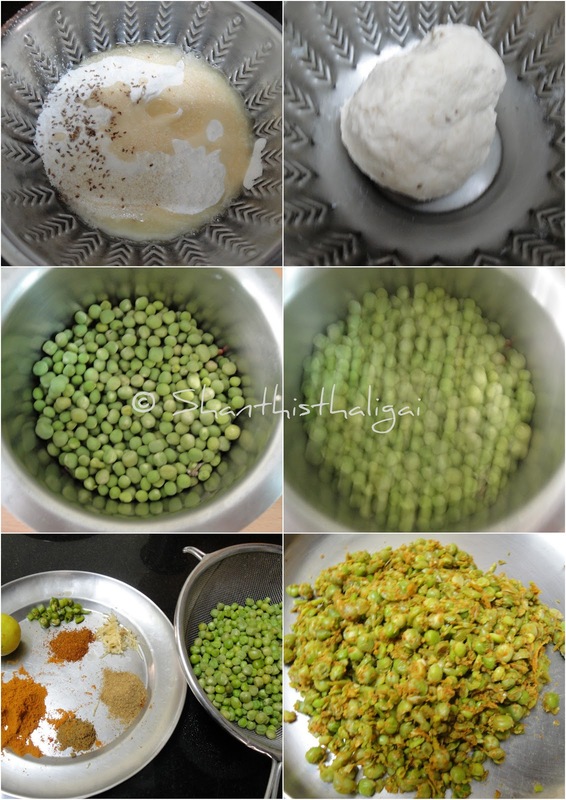 Meanwhile, cook peas in water alongwith salt. Drain the water completely and mash cooked peas slightly. Add all other ingredients given for filling and mix well. Filling is ready. Keep aside. (If using onions, chopped onions can also be added ). Now divide the dough into small equal portions and shape into balls. Take a ball, slightly dust with flour and using a rolling pin roll out each ball into a circle, put a small portion of the filling in middle, fold to make a semi circle and press the edges to seal it well. You can also make a thin solution of flour and water and apply it with a finger tip all over the edge to seal it. 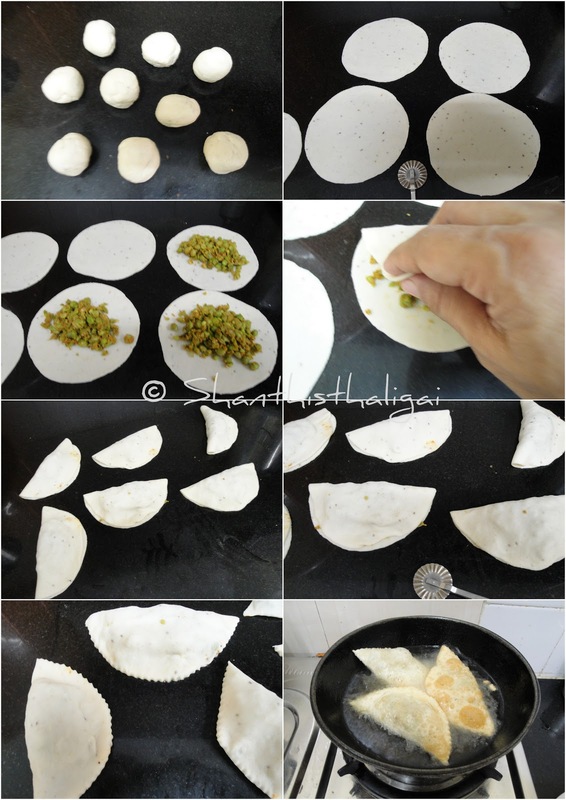 Cut the edge of Gujiya to give a shape by pressing with a fork or gujiya cutting spoon. I used the spoon to get curved edges. You can also use a somasi / karanji mould. Heat oil in a kadai, slide the karanjis gently and fry them in batches on medium heat until they are golden brown and crispy. Drain on a kitchen tissue. Serve hot with green chutney and sweet chutney or ketchup. NOTE: Cover the dough with a damp muslin cloth to prevent it from drying. Do not over fill the stuffing. Seal the karanjis well, else the stuffing will spread in oil and you will end up in a mess. Delicious snack. Perfect for the monsoon season.